Even the warranty had to be re-designed. 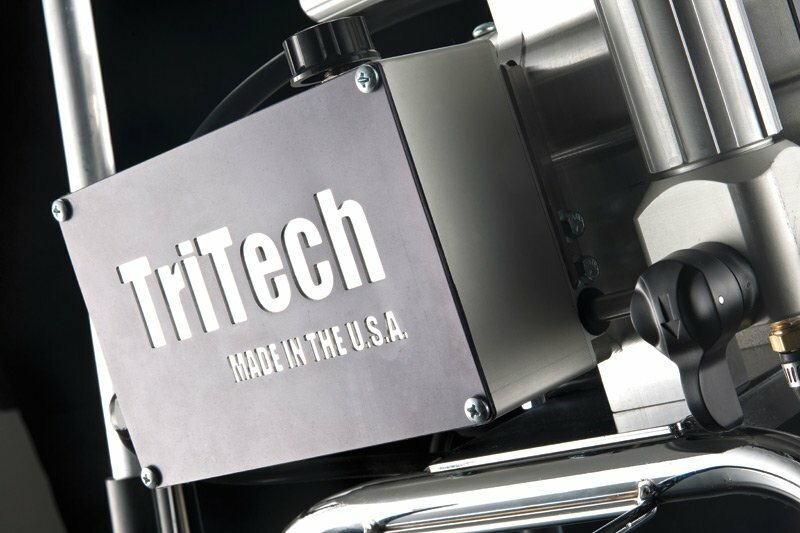 TriTech takes great pride in its manufacturing capabilities and that all of their equipment is ‘100% USA Designed & Manufactured’ and come with a lifetime warranty. The motor, including the brushes and drivetrain of any TriTech airless sprayer are warranted under normal use and service against defects in craftsmanship or material for the lifetime of the product. All other components are covered against defects in craftsmanship or material for three years from date of purchase. 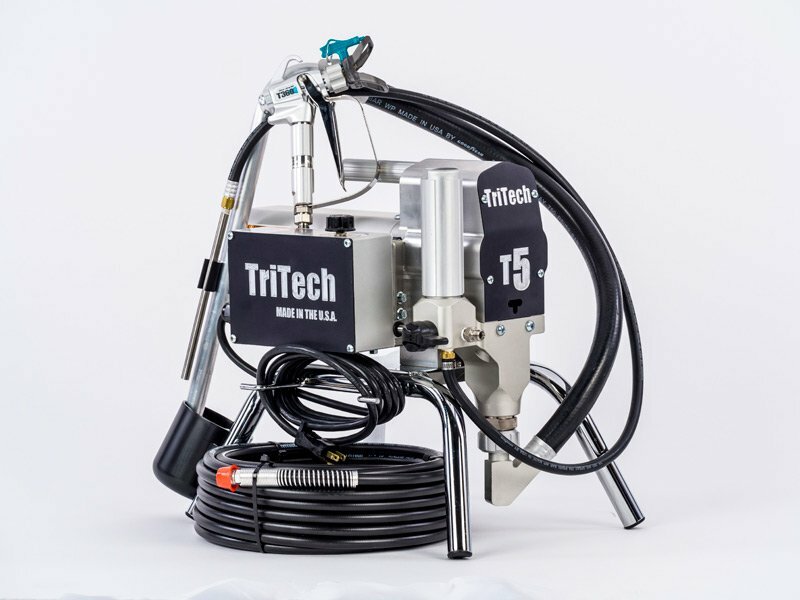 When TriTech set out to design and manufacture a range of airless paint spraying pumps they only had one objective. To make them the best. Whether it’s Hi-Cart or Stand, all TriTech pumps are built round a heavy walled steel tubing frame that is fully chromium plated for durability. Both units are carefully designed to ensure perfect balance for moving them across site. There’s even a heavy duty stainless steel pail hook on the Hi-Cart that makes easy work of moving the unit complete with a 20 litre bucket. Even the tyres have been thought about. They are semi-pneumatic for no-flat reliability. These pumps are built to be used. All day, every day. There’s one manifold for both the filter and pump section, with no need for extra tubes and hoses. Large porting connects the pump to the filter. It’s easy to clean and promotes proper drainage to keep the filter and pump manifold clear of debris. The all-stainless steel filter screen with outside in flow makes maintenance fast and easy. The filter bowl is hand tight so access requires no tools. Aerospace grade materials are used for the manufacture of the pump. No component in the pump manifold will ever rust. The pressure relief valve housing is made from high quality stainless steel and the ball and seat are made from TriTech proprietary carbide blend for long duty life and reliability. The positive shut off it gives means you’re always ready to spray. TriTech are a part of a manufacturing group that has been in business continuously since 1955, primarily as a precision manufacturer of parts for a wide range of industries. 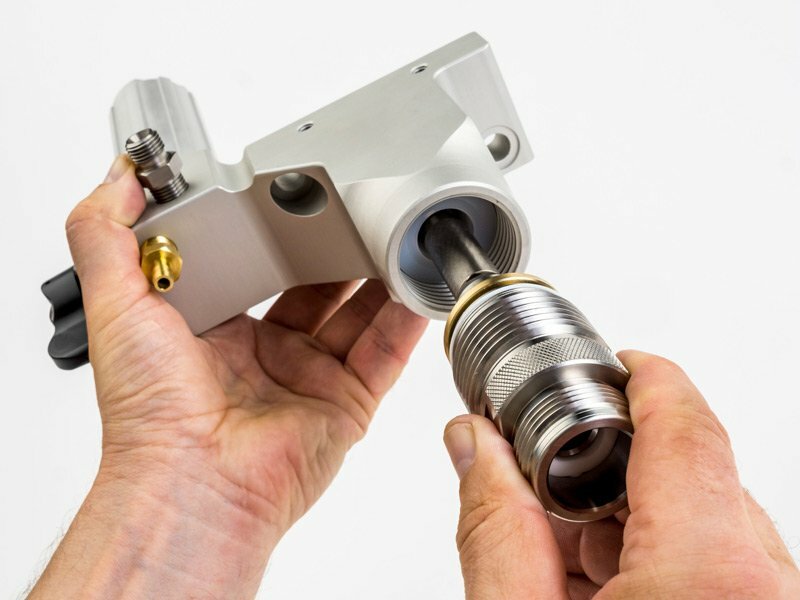 This includes components for military helicopters, missiles, super computers and OEM shock absorbers as well as countless other industrial, military and aerospace machined parts. As a part of this manufacturing group TriTech shares the same pride in the highest standard of manufacturing and can produce at a level of precision not seen in this industry before. To many manufacturing companies there would be a world of difference between making components used in missiles or super computers and manufacturing airless paint sprayers. Not to TriTech! The care and precision that go into every part manufactured is exactly the same. It starts with an innovative product design where the correct material is rigorously researched and selected. Then the right machining centre is selected to ensure the part is manufactured efficiently to the standard required. Finally the part goes through a rigorous inspection process. "It's good enough" is not the standard at TriTech. The engineering and sales team at TriTech have been in the airless industry for over 25 years. 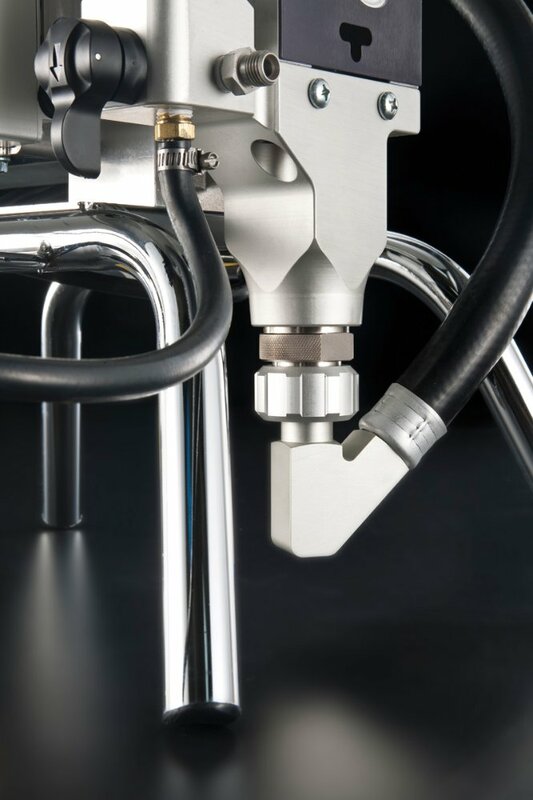 Their goal is to couple that experience with the skill available in the precision manufacturing group to produce an airless sprayer that will work for you every day, year in and year out. These pumps are the result of that mission. If you have used TriTech’s airless tips and guns you would already know how serious they are about quality. 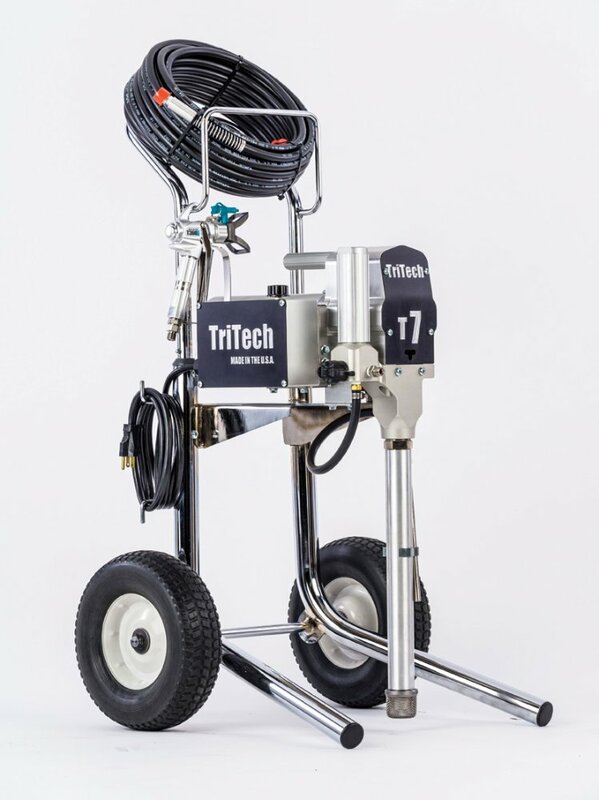 Next time you need an airless sprayer think TriTech – the quality driven American made alternative. For a demo of this machine or any other spray equipment enquiries, email bradley.gibbs@elmbridgesuppliesuk.com or call us on 01452 525757.